Suture anchor fixation is a new surgical option for the fixation of juvenile Tillaux fractures. Department of Orthopedics, Centro Hospitalar Vila Nova de Gaia/Espinho, Vila Nova de Gaia, Portugal. Introduction: The Tillaux fracture is a rare subtype of tibial physeal fracture that usually occurs in adolescents. There are only a few case series or reports published in the literature and, to our knowledge, this is the first time, a painful nonunion is reported after this type of fracture. Case Report: A 13-year-old athlete presented to our orthopedic department because of persistent pain after an acute ankle injury 2months before. 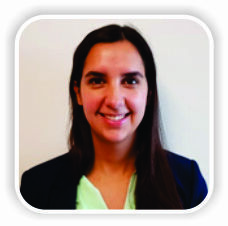 She was diagnosed with a Tillaux fracture that eventually progressed to nonunion after conservative treatment. Surgery was performed to treat the nonunion, and the fracture fragment was fixed using a soft suture anchor. Conclusion: The Tillaux fracture pattern requires a high level of clinical suspicion and careful evaluation since it can be misdiagnosed as a simple ankle sprain in adolescents and progress to persistent ankle pain without appropriate treatment. Our surgical technique of suture anchor fixation avoids the risk of fragmentation of the fracture fragment and was able to provide an excellent clinical result. Keywords: Tillaux, Nonunion, Suture anchor. The incidence of tibial physeal fractures is reported to be second only to those of the distal radius . The skeletally immature athlete is particularly susceptible, with physeal ankle fractures accounting for 40% of sports-related injuries reported in children . The Tillaux fracture is a particular subtype of tibial physeal fracture that usually occurs in adolescents. It is characterized by separation of the physis with a fracture extending into the anterolateral portion of the epiphysis and joint with no metaphyseal involvement (Type III fracture according to the Salter-Harris classification). The fracture´s name derives from the French surgeon, Paul Jules Tillaux, who was responsible for the first description of this injury, in a cadaveric study performed in 1892. Later, in 1964, Kleiger and Mankin further reported on these fractures in adolescents, following their extensive work on distal tibial fractures . This is a rare type of injury with only a few case series or reports published in the literature to this date. 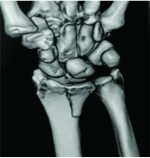 In this report, we describe the first case of a painful nonunion following a missed juvenile Tillaux fracture. The fracture was fixed using a soft suture anchor – a new fixation technique that we also describe. A 13-year-old female competitive basketball player sustained a forced external rotation type of injury to her left ankle while training. The injury was initially diagnosed as a mild ankle sprain by her clubs physician who recommended 2weeks non weight-bearing, followed by a period of progressive return to sports. No imaging studies were performed at that time. Due to persistent moderate ankle pain and inability to perform, the patient was referred to our orthopedic department 2months after the initial injury. She had mild swelling over her ankle and well-localized pain on palpation of the anterolateral portion of her ankle. Weight-bearing was painful but the range of motion was normal, and there were no palpable bony deformity, bruising, or neurovascular compromise. Plain radiographs showed an irregular lucency on her lateral distal tibial epiphysis (Fig. 1) that was further evaluated with a computed tomography (CT) scan – the coronal and axial images showed a small, Salter-Harris Type III fracture of the anterolateral portion of the distal tibial epiphysis (Fig. 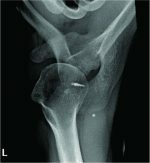 2), findings consistent with the diagnosis of a juvenile Tillaux Fracture. Non-operative treatment was decided as the fracture was considered undisplaced (even though in hindsight slight rotation of the fragment was noticeable on the CT scan). The treatment consisted of 6 weeks of immobilization in a plaster splint followed by progressive physical therapy and rehabilitation. This course of treatment was unsuccessful, as 6 months after the initial injury, the patient still had pain on weight-bearing and was unable to return to sports. At this time, another CT scan was performed that showed a lucency between the fragments and sclerosis of the fracture borders, consistent with nonunion of the fracture and surgical treatment was proposed (Fig. 3). An anterior ankle arthrotomy was performed through a longitudinal two-centimeter incision, and the tissues were dissected between the peroneal muscles and extensor tendons. On inspection, the fracture site was filled with fibrous tissue, and there was gross mobility between the two bony fragments. The fracture line was debrided, and the bone borders were curetted and drilled with a smooth K-wire to enhance the migration of mesenchymal cells into the fracture site. Fixation was obtained using a soft suture anchor– JuggerKnot Soft Anchor 1.4 Short (Biomet, Warsaw, USA). The patient started partial weight-bearing immediately and by 6 weeks post-operative–as the X-rays appeared normal (Fig. 5) –she progressed to full weight-bearing. At 12-weeks postoperative, solid union was confirmed with a magnetic resonance imaging (Fig. 6) and she was allowed to return to sports. With >3 years of follow-up, she is pain free, has normal ankle range of motion and still maintains her sporting activity at the same level as before. Tillaux fractures are uncommon injuries that occur either by lateral rotation of the foot or by medial rotation of the leg on the fixed foot . The distal tibial physis closes in an asymmetrical manner – it begins at the central part of the physis, proceeds to the medial portion, and then concludes in the lateral portion of the epiphysis . 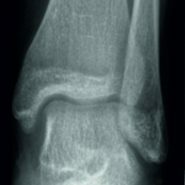 The anterolateral portion of the epiphysis is the last portion to close making this region susceptible to an avulsion fracture when external rotation places stress on the anterior-inferior tibiofibular (AITFL) near skeletal maturity –usually between ages 12 and 14 in girls and 15–18 in boys. As this type of fracture occurs late in the closure process of the physis, there is a very low reported incidence of complications associated with growth arrest . In fact, the primary concern is the disruption of the weight-bearing surface of the tibia, and anatomical reduction is of paramount importance to prevent the development of premature degenerative arthritis . Conservative treatment is recommended for undisplaced fractures and, with adequate and timely reduction, the prognosis is very good and full recovery should be expected in almost all cases . There is no reported data on the prognosis after missed Tillaux fractures and, to the best of our knowledge, this is the first time, a painful nonunion is reported after this type of fracture. This further emphasizes the need for careful evaluation during the initial assessment of ankle injuries in adolescents, as the clinical and radiological findings of undisplaced Tillaux fractures are often subtle and can be easily overlooked. Surgical treatment is usually reserved for fractures with >2-mm displacement after attempted closed reduction . In most reports, the fracture is usually fixed with smooth K-wires, pins, or lag screws . 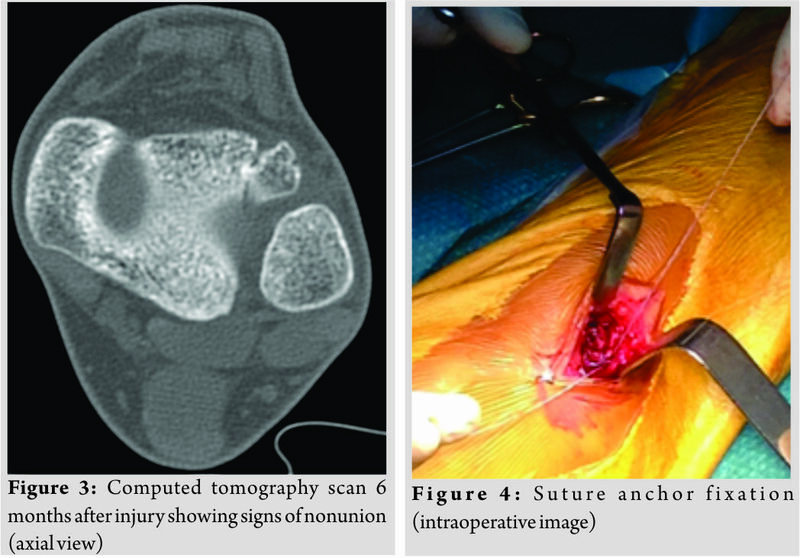 In addition, many recent articles describe the fixation of Tillaux fractures percutaneously through arthroscopic and/or radiological control ;however, in this case, we thought that an open procedure was necessary to debride the nonunion site. The technique we describe is unique in that we obtained fixation with a soft suture anchor to avoid the risk of fragmentation to the anterolateral fragment, as it was very small. The suture was passed in a figure-of-eight configuration over the AITFL to act as a tension band, thereby transforming the forces that would otherwise displace the fragments into compressive forces across the fracture site. The excellent functional result, in this case, may be indicative that this newly described method of fixation may be a good option when the dimensions of the anterolateral physeal fragment are small. The Tillaux fracture pattern is rare and requires a high level of clinical suspicion, as it can be misdiagnosed as a simple ankle sprain in adolescents. Most undisplaced Tillaux fractures heal uneventfully but, as shown in this report, nonunion is a possible complication when timely treatment is not instituted. The described method of suture anchor fixation may be a valuable addition to the orthopedic surgeon’s armamentarium in the treatment of this type of fracture, as it produces excellent fixation while reducing the risk of fragmentation. With this paper, the authors pretend to highlight the importance of an accurate diagnosis of juvenile Tillaux fractures since these require knowledge of the fracture pattern and a high level of clinical suspicion. Most undisplaced Tillaux fractures heal uneventfully but, as shown in this report, nonunion is a possible complication when timely treatment is not instituted. The method of suture anchor fixation we describe for the first time may be a valuable addition to the orthopedic surgeon’s armamentarium in the treatment of this type of fracture, as it produces excellent fixation while reducing the risk of fragmentation. 1. Peterson CA, Peterson HA. Analysis of the incidence of injuries to the epiphyseal growth plate. J Trauma 1972;12:275-81. 2. 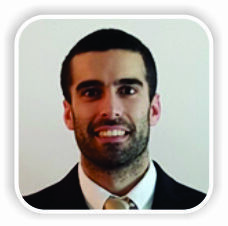 Goldberg VM, Aadalen R. Distaltibial epiphyseal injuries: The role of athletics in fifty-three cases. Am J Sports Med 1978;6:263-8. 3. Kleiger B, Mankin HJ. Fractures of the lateral portion of the distal tibia epiphysis. J Bone J Surg Am 1964;46:25-31. 4. Dailiana ZH, Malizos KN, Zacharis K, Mavrodontidis AN, Shiamishis GA, Soucacos PN, et al. Distal tibial epiphyseal fractures in adolescents. Am J Orthop (Belle Mead NJ) 1999;28:309-12. 5. Mac Nealy GA, Rogers LF, Hernandez R, Poznanski AK. Injuries of the distal tibial epiphysis: Systematic radiographic evaluation. AJR Am J Roentgenol1982;138:683-9. 6. Barmada A, Gaynor T, Mubarak SJ. Premature physeal closure following distal tibia physeal fractures: A new radiographic predictor. 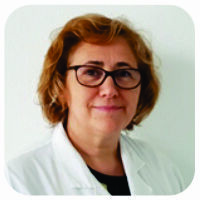 J PediatrOrthop2003;23:733-9. 7. 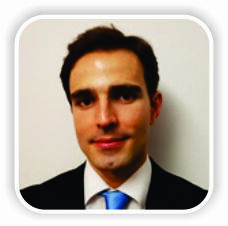 Panagopoulos A, van Niekerk L. Arthroscopic assisted reduction and fixation of a juvenile tillaux fracture. Knee Surg Sports TraumatolArthrosc2007;15:415-7. 8. Kennedy MA, Sama AE, Padavan S. The tillaux fracture: A case report. J Emerg Med 1998;16:603-6. 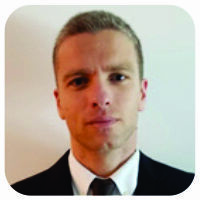 9. von Laer L. Classification, diagnosis, and treatment of transitional fractures of the distal part of the tibia. J Bone Joint Surg Am 1985;67:687-98. 10. Jennings MM, Lagaay P, Schuberth JM. Arthroscopic assisted fixation of juvenile intra-articular epiphyseal ankle fractures. 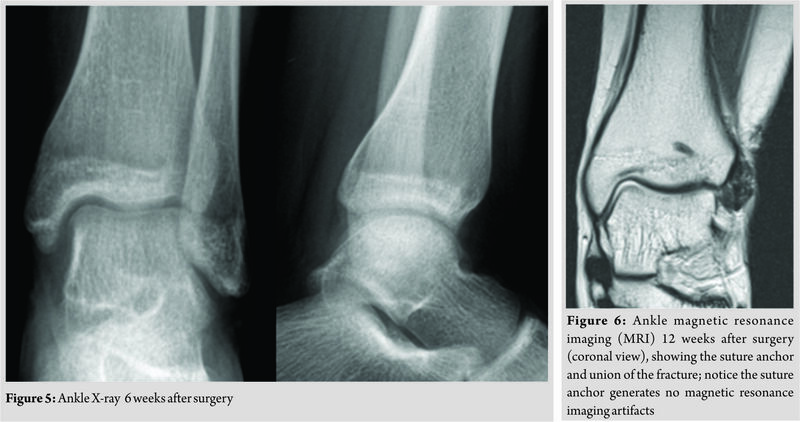 J Foot Ankle Surg 2007;46:376-86. How to Cite This Article: Santos-Pereira R, Aleixo C, Oliveira M, Sarmento A, Santos M. Painful Nonunion after Missed Juvenile Tillaux Fracture in an Athlete – Case Report and Description of a New Fixation Technique. Journal of Orthopaedic Case Reports 2018 Sep-Oct; 8(5): 7-10.